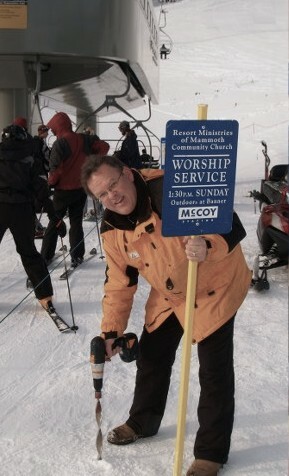 I have been a pastor for eighteen years and a ski chaplain for twelve. It is my conviction that a pastor should not enter this occupation as a carreer but only if he is convinced that God has "called" him to such a work as this (Jeremiah 1:5; Isaiah 49:1; Luke 1:15; Acts 9:15; 13:2-4; Ephesians 4:8-16). Furthermore, I believe that a pastor is called to a church and a place for ministry (Acts 8:26ff; 16:9). This is how we feel about this town and this congregation. To prepare for this calling, God led me to the Masters College, Seminary and to Grace Community Church. The staff and ministers there had a major influence on my life. While I am grateful for their examples, what I appreciate most is the training and passion I have inherited from them to study, apply and teach God's Word (1 Timothy 4:6-16). Upon graduation, I received the Bachelor of Arts and Master of Divinity degrees. There are two Scripture passages in particulare which guide the way ministry is done here: "God is spirit, and those who worship Him must worship Him in Spirit and truth." (John 4:24) and "... the goal of our instruction is love from a pure heart and a good conscience and a sincere faith." (1 Timothy 1:5). Our church growth methodology is simply Ephesians 4:8-16.